Too often we separate ourselves from the beauty, power, and grace of the Epiphany and settle for a flash of insight. We work to “get it,” waiting and hoping that one day the light will come on. We have been convinced that the “aha” moment is our epiphany. That, however, is a diminishment and impoverishment of the Epiphany. It is not the gospel story we just heard and it is not the Epiphany we celebrate today. The Epiphany we celebrate today is not about “getting it.” It is about what we have already been given. The Epiphany is the manifestation, the revealing, the showing and making known that divine life and presence fill all humanity and creation. It is most fully and profoundly revealed in the person of Jesus Christ. It is not, however, limited to him. He is the archetype of who we can become and the way of our becoming. The manifestation of God in and through Christ is the aperture through which we see the truth about our lives. Whether we know it, understand it, or believe it divinity, God’s life, is the treasure and gift we each carry. Every one of us is a magi. We are carriers of the treasure. We have been entrusted with divine gifts. We are, as a friend of mine likes to say, “epiphanal beings.” That is true for you, me, and every other person, even Herod. The Epiphany is not limited to a specific time, place, or a particular people. It is for all people, in all places, at all times. There is no one who does not carry this treasure. The difference is not that some carry the treasure and others do not. The difference is between those who know and trust themselves to be carriers of the treasure and those who are blind to and ignorant of the treasure within them. That is what distinguishes the wise men from Herod. The Herods of this world, those who do not know the treasure they carry, the treasure they are, remain closed and isolated. They will always live in fear, demand answers, seek absolutes, make judgments, establish a cult of personality, wield individual power, and relate through violence. The wise man or woman, the one who knows himself or herself to be a bearer of gifts, however, is willing to open his or her treasure chest and offer those gifts. They hold nothing in reserve, offering all that they are and all that they have. Every day we have the opportunity to bring and offer our gifts to the world and in so doing we pay homage to the child. We reveal and make the child known to the world. Our gold, frankincense, and myrrh are offered in a thousand different ways. Every time we offer our gratitudes and prayers of thanksgiving we are pointing to the presence and work of God in our lives. Whenever we spend time feeding the hungry, housing the homeless, or caring for those in need we are revealing God’s compassion and concern for his people. Whenever we freely and without need of recognition give our money to care for and help another we are demonstrating God’s generosity. Our presence at the bedside of one who is sick or dying reveals God with us, Emmanuel. Whenever we offer forgiveness rather than retribution and mercy rather than condemnation we demonstrate God’s grace. The moments we spend in silence, solitude, and stillness manifest the mystery of God. The intimacy we share with another is a reflection of God’s self-giving love. Every time we offer our treasure we are mirroring God’s offering of his treasure. The only reason we can ever offer our treasure is because God first offered his. It happened that night when God opened the treasure chest of his house to reveal the child with his mother Mary. 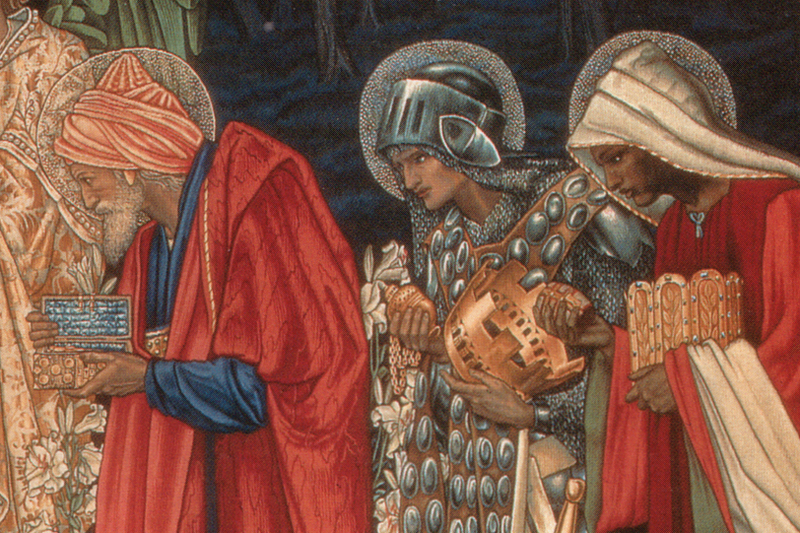 In response, the magi opened their treasure chests and offered gifts. God has never ceased opening the treasure chest of his life and offering gifts. Each one of us continues to carry the treasure of God’s life. That is the truth and good news of Epiphany. Every gift we offer from that treasure reveals God’s life and presence. The Epiphany of God calls forth our own epiphany. Epiphany meets epiphany, treasure meets treasure, and God’s life and presence fill this world and our lives. It’s not just something we do, it’s who we are. Our lives become epiphanies, manifestations, of Christ to the world. The above sermon is based on Matthew 2:1-12 and was given on the Feast of the Epiphany. The collect and readings for the day may be found here. Your posts are becoming more and more powerful my friend. Thank you Stephanie for your very encouraging comment. As I make myself face my fears this year, I truly appreciate this post. Roberta, I hope the light of Epiphany scatters the darkness and illumines the gifts within you. Thank you Chris. May the Epiphany light fill and bless you. I only discovered your blog by a google coincidence, but maybe God is the Ghost in the machine. I read last weeks one, as I was preparing to preach. And I have just read this one now. Brilliant! I don’t know why because it’s almost too easily spoken, but it touches the heart where the heart says Aha! I quoted you in the bulletin on Epiphany Sunday. I don’t do that often. And reading today; “the treasure they carry, the treasure they are” touched me again. It also reminded me of Mt. 13:52, also about the opening of gifts. The scribes trained for the Kingdom of heaven. wonderful. Thank you, Hugh, for your encouraging words. I really like the connection you make to Mt. 13:52. There are infinite treasures within us waiting to be discovered and brought forth.